Statistics Canada says manufacturing sales declined 0.9 percent to $49.6 billion in January, the second decrease in seven months. Get the numbers here. Get Connected: No Strings Attached! The rugged Wireless DataMan® 8000 series of readers offers the industry's most advanced technology for reading 1-D and 2-D codes regardless of size, quality, printing method or surface, and is the only wireless industrial handheld barcode reader that offers Industrial Ethernet communication and liquid lens technology. Sales of machine vision components and systems in North America climbed five percent in 2011, according to new figures released by AIA, the industry's global trade group. Get the details here. Surteco Canada Ltd., carrying on business as Doellken-Woodtape, an international manufacturer of plastic edging for use on furniture, was fined $50,000 for a violation of the Occupational Health and Safety Act after a worker was injured. Learn more. Canadian sales of new cars and trucks opened the year on a resoundingly positive note, but may have fallen off last month, according to Statistics Canada. Learn more. As Canada continues to grapple with the challenges of an aging workforce, there's no better time to consider today's youth as potential skilled workers for tomorrow. That's why Fabtech Canada 2012 is hosting student tours on March 22. Learn more here. January U.S. manufacturing technology orders totalled $401.69 million US, according to AMT - The Association For Manufacturing Technology. This total, as reported by companies participating in the United States Manufacturing Technology Orders program, was down from December, but up when compared with January 2011. Get the numbers here. 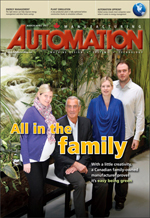 A new Sciencetech report released in partnership with the Canadian Alliance for Advanced Technology (CATAAlliance) asserts that the control of embedded systems is crucial for the future of Canada's manufacturing industry. Learn more from the analysis here. In the past, operators of a boring machine in an underground potash mine were responsible for controlling a device called a bridge conveyor that drops ore onto a long main conveyor. The main conveyor hauls the ore to the loading pocket and from there it is transported to the surface by the skip. The operators had many other jobs to do, so the conveyor was often loaded unevenly, which could create spills that took hours to clear. Another problem was that the mine operators had no way of knowing how much potash was loaded on the conveyor, which made it challenging to plan shift changes that minimized downtime for the skip. Learn how machine vision solved these challenges. At Polaris Industries, implementing a vision system reduced scrap in a high-mix welding environment and paid for itself in two weeks. Learn how. Learn how Guelph, Ont.-based Hammond Power Solutions is decreasing workplace accidents and increasing productivity in the manufacture and testing of its transformers with the help of Omron's software-based safety controller and integrator Bellamy Electric. Find out how Sony of Canada reduced errors and improved throughput by implementing voice-directed picking technology. Imaginit's Scott Hale reveals how to identify and target inefficiencies within your design process, and yield productivity gains through automation. InSight Consulting's Doug Nix examines the misconceptions and challenges that designers face when selecting the most basic elements in interlocking systems. Plus: The latest news and trends, as well as a selection of the latest communications and networking products, power supplies, process control offerings, wireless technologies, data acquisition products, motion control offerings, and wire and cable products.